Sarah Nicole Mitchell graduated Friday. 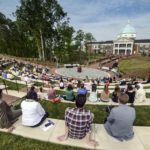 She leaves HPU with two degrees – one in political science, the second in international relations. She graduated a semester early, and next month, she’ll become a graduate student at George Washington University and pursue a masters’ degree in political management with a concentration in electoral politics. Beyond her achievements as a Presidential Scholar and membership in three honor societies, she is president of HPU’s College Democrats, HPU’s Organizing Fellow for the Campus Vote Project and a veteran of two high-profile political campaigns. That includes working for nearly seven months as a volunteer and later a field organizer in Florida for Hillary Clinton’s 2016 Presidential campaign. Mitchell is now HPU’s Extraordinary Leader for the month of December. Her undergraduate work earned her that distinction. But to understand how her interest in politics began, go back to an ice rink where three little girls who could barely speak any English cling to a wall. From left to right are Hoot-si, Ni-Lar and Hoot-tu. 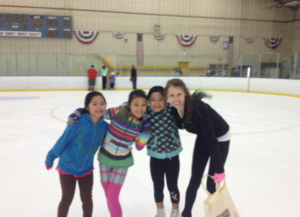 Mitchell helped teach them how to skate when she was in high school in upstate New York. It was middle school when Mitchell got back into skating. She joined Empire Edge, a synchronized skating team, and they practiced at a local high school rink. Mitchell grew up Mechanicville, New York, population 5,195. Mechanicville, New York’s smallest city, covers less than one square mile. In that tiny city 30 minutes north of Albany, the state’s capital, Mitchell met three girls that changed her life. Twin sisters, Hoot-Tu and Hoot-Si, and their friend, Ni-Lar, were no more than 8. They came to the public skating session at the local high school, and 30 minutes before Empire Edge began practice, Mitchell helped the three girls learn how to skate. She became enamored with the little girls. 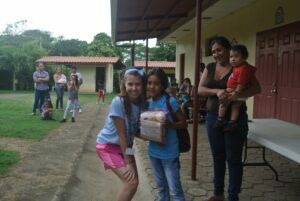 She helped them with their homework and their English. In doing so, she got to know their story. The girls’ families fled southeast Myanmar to escape ethnic and religious persecution. They landed in refugee camps in Thailand and came to upstate New York, with the help of the U.S. Committee for Refugees and Immigrants. Mitchell went on two 10-day mission trips to Nicaragua with North Country Mission of Hope and met girls like Angelina and helped her obtain sponsors to pay for her education. That chance encounter opened Mitchell’s eyes to the rest of the world. Mitchell began teaching English at the local literacy center and helped refugees adjust to their new life in America. 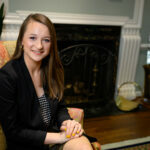 With that question ringing in her ears, Mitchell came to HPU. 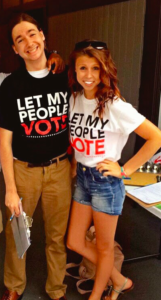 Mitchell worked with junior Abby Knudson (left) and freshman Dalton Lucas (right) at HPU for the Campus Vote Project. When time came for college, Mitchell searched for a university that focused on character and professional development. From that search, Mitchell found HPU. When she came to visit, she felt HPU was different. Dr. Martin Kifer, chair of HPU’s political science department, talked to her for an hour. Then, while walking into HPU’s Hayworth Fine Arts Center, she looked up. 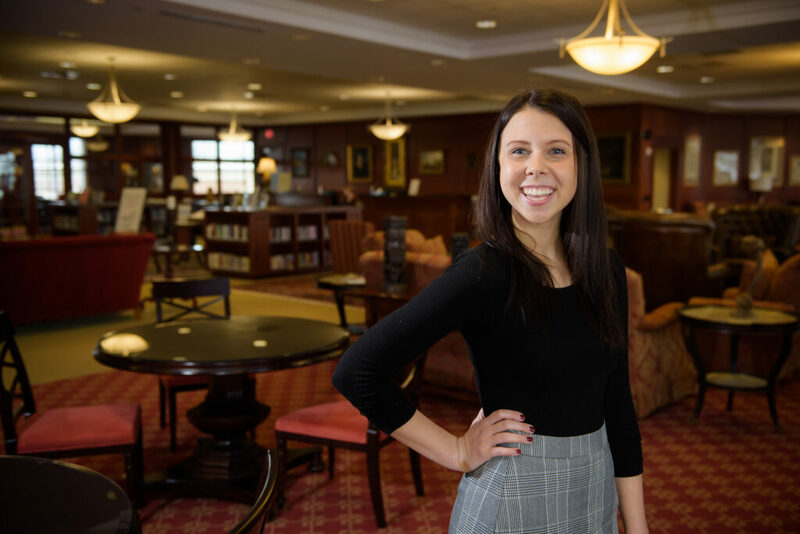 She knew then that HPU would help her become what she wanted to be – a young woman intent on getting involved to make her world a better place. As an HPU freshman, she went to a debate at the Wanek Center wearing a Hillary Clinton sticker. An upperclassman, a Clinton supporter, saw it and recruited her to work in Clinton’s office in nearby Greensboro. A few weeks later, Mitchell got a phone call from the organizer. Mitchell worked with other Organizing Fellows like Jason King in Florida during the 2016 Presidential campaign. she didn’t even know if it was doable. Kifer and her advisor, Dr. Mark Setzler, told her it was. Mitchell received an internship credit, and Kifer and Setzler turned her work with the Florida Democratic Party into an independent study. With that academic peace of mind, Mitchell started as an Organizing Fellow. Following her second trip to Nicaragua with the North Country Mission of Hope, she came back and was promoted to field organizer in Jacksonville, Florida. 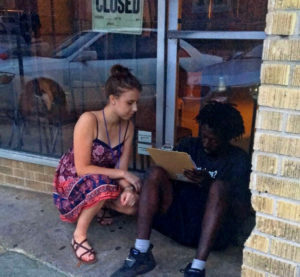 She worked with five organizing fellows and hundreds of volunteers. By the campaign’s end, her team made more than 27,000 recruitment calls, knocked on almost 7,000 doors, made more than 22,000 voter contact calls and registered more than 1,500 new voters. A year later, she spent two months as a get-out-the-vote lead organizer in Democrat Ralph Northam’s primary campaign for governor in Virginia. And what role did HPU play in all that? 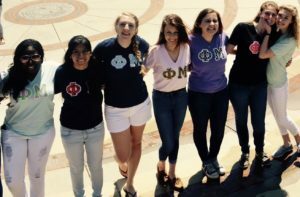 Mitchell with her sorority sisters of Phi Mu her freshman year. From left to right are Macketta Johns, Emily Cole, Brianna Beard, Jordan Kenter, Kezia Lawson-Shanks and Paign Wagner. This fall, outside The Café in the Slane Student Center, beside boxes of doughnuts, Mitchell yelled at almost every student she saw. 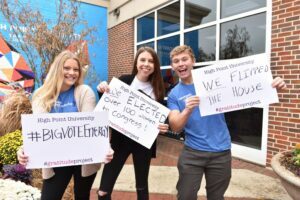 She and two other students she worked with — freshman Dalton Lucas and junior Abby Knudson — registered nearly 500 HPU students to vote. For Mitchell, that was a winning combination. Mitchell helped register hundreds of voters like this one in Jacksonville, Florida. A few days before her graduation, Mitchell displayed her purple graduation tickets like a winning hand in a card game. The tickets were for her parents — James, a medical supply salesman; and Dawna, a college secretary. They were flying down from upstate New York to attend the big event. Mitchell’s parents had never attended college. Now, they were going to see their only child graduate from college with honors. Even yelling near boxes of doughnuts?